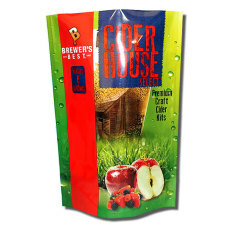 Our Cider House Select ingredients kits, come with all the ingredients you need to make 6 gallons of delicious hard cider. Packed full of flavor, these ingredients kits are perfect for any level of experience! A traditional hard sparkling cider that is packed full of flavor. This apple cider is crisp, light, and refreshing. A perfect choice any time of the year! Hard apple cider with a charming and warming character, compliments of the cinnamon and spices. This cider is enjoyable chilled or as a warm mulled cider. The taste of juicy pears combines with the unmistakable tones of fresh strawberries creating perfect harmony throughout this delicious fruit hard cider. Bursting with pear flavor from the very first sip, this hard cider is deliciously easy to drink! A perfect companion for any day or evening event. A delicious cider blend that incorporates Mango and Peach flavors for a truly unique cider experience! An apple base provides a fruit forward flavor that is well balanced with a subtle sweetness of ripe blueberries. Highly refreshing! Apple cider, with a wonderful, refreshing pineapple flavor and aroma!